Communist Russia! Ah yes, those were the days! Gulags, famines and Stalin's wildly paranoid purges were just some of the delights waiting for people under the hammer and sickle. Communism obviously worked and, not only did it work, it was an absolute hoot. A real rib tickler in fact and, inevitably, a sitcom followed. Was it about a lowly peasant named Aleksei who wrestled bears for the Tsar's personal pleasure? No. It was about a middle aged chap called Reg living in London(grad) and in thrall to communism under the title Comrade Dad. 1989 saw Margaret Thatcher, Queen Elizabeth II and Philip the Terrible being overthrown by the USSR and communism taking root in Great Britain or, as it was now known, USSR-GB. Fast forward 10 years and Reg Dudgeon (George Cole) eagerly hangs on every word of Chairman Hoskins - the figurehead of Communism in the USSR-GB. Reg and his family have adapted - as best they can - to the new regime. Rationing is commonplace and the humble beetroot is the staple of most meals along with a mug of steaming hot conker coffee, but you can get some carrot vodka on the sly. Reg's wife Treen (Barbara Ewing) finds herself working the night shift on railway lines and frustrated in the bedroom due to Reg's dedication to the regime. Comrade Dad first emerged as a pilot episode which aired on 17th December 1984 on BBC2 at 8pm. The BBC were impressed enough and, perhaps due to George Cole's high profile at the time, commissioned a full series which was produced in-house. Filmed on a mixture of videotape and 16mm the 7 episode series began transmitting in January 1986. Writing the show was the duo of Ian Davidson and Peter Vincent who had, between them, written for Dave Allen, Dame Edna, The Two Ronnies, Ben Elton and Frankie Howerd. John Kilby was the director for Comrade Dad and came to the show having directed Hi-de-Hi!, It Ain't Half Hot Mum and Are You Being Served? 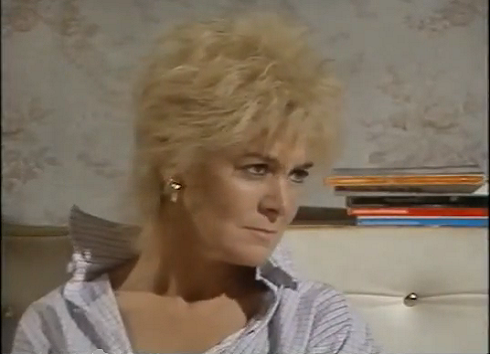 Not surviving the pilot were Colette O'Neil as Treen Dudgeon and Anna Wing as Gran. Doris Hare took on the role of Gran in the series proper. Growing up, Minder was a perennial fixture on Curious British Telly's gogglebox, so George Cole almost seemed like one of the family. Without communism, we would've missed out on the amazing post apocalyptic fiction of the 1970s and 80s. A mixture of these two was sure to impress, wasn't it? The opening credits of Comrade Dad establish a fantastic premise: Russian guards marching across Trafalgar Square where Nelson has been toppled from his column and replaced with a red star. Britain has been invaded and placed under communist rule. Comedy is all about conflict and the potential for tension is immense. Sadly, Comrade Dad centered upon Reg - a man in thrall to his superiors. The viewer is, instead, subjected to mild farce as Reg strives to become a party member. Linear plots infest the series and only one episode stood out as interesting. In it, Reg, quite by accident, discovers a party of rich people living life to excess with champagne and fancy dress. The party line is that rich people have been done away with and it looks as though Reg is finally beginning to question the communist propaganda. Will this lead to lowly Reg Dudgeon smashing the system? No. Instead he remains besotted with the new regime and, well, *sighs*. The humour... Oh dear. Comrade Dad failed to make us laugh once. The studio audience appear to be convulsing on the floor with laughter, but we're not sure what at. The jokes about eating beetroots, respecting beetroots and the wonder of beetroots are forced down our throats with a relentless regularity which made us gag. Funnily enough, we do love a bit of beetroot, but not here. One thing that did make us smirk throughout were the various background jokes plastered on billboards which took swipes at communism. It's just a shame these didn't translate into the dialogue. 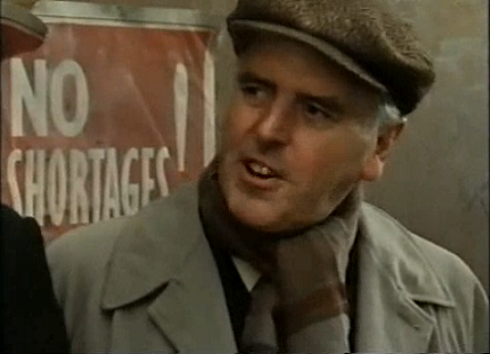 The acting on show is of no great shakes, but George Cole, of course, stands head and shoulders above the rest. His speech patterns are quite remarkable. He manages to squeeze about a million words into one sentence, but always does it with such a fluid rhythm it doesn't sound forced. Many of the mannerisms found in Arthur Daley are on show, but Reg doesn't have a single crooked bone in his body - apart from sticking on some forbidden rock and roll records in one episode. As a result, he's a fairly two dimensional character with few nuances and quirks for George Cole to get much out of him. We were disappointed by Comrade Dad as it could have been something so much more. George Cole was huge in the mid 80s as he battled with David Jason to see who would be crowned television's King Cockney, so Comrade Dad feels like a star vehicle for Mr Cole. The rest of the cast have reduced roles as a result, but the story of Reg Dudgeon isn't very engaging and the show suffers greatly for this. Conflict between Reg and the communist Regime would have been much more entertaining, but, perhaps due to 'Allo 'Allo! pulling this trick off, the writers found themselves rather handicapped. We found a few traces of nostalgia for the show online, but feel that it's relative obscurity is no surprise. Six of the seven episodes are available on YouTube and it's worth a punt if you're a fan of George Cole, but otherwise we'd say it's one to miss.